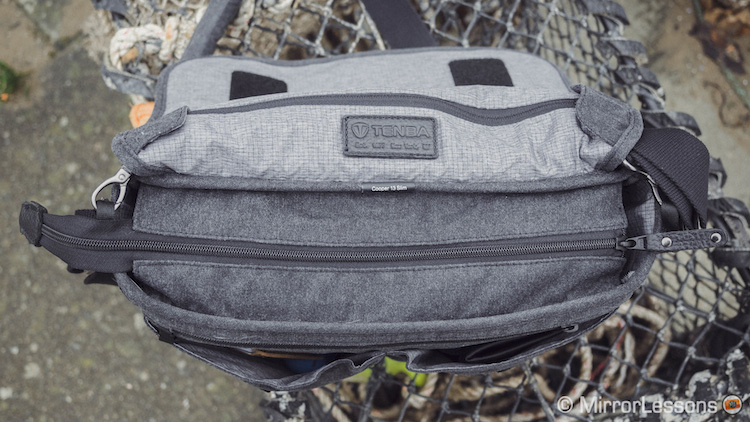 The most recent camera bag we had the opportunity to test was the Tenba Cooper 13 Slim, the second smallest of four messenger bags in the brand new Cooper range. 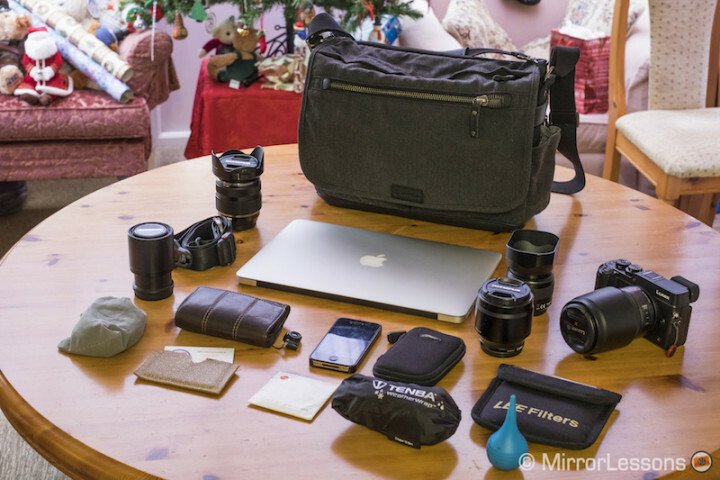 At first, we were undecided between the Cooper 13 Slim and its little brother, the Cooper 8, but since the latter only fits 2-3 lenses and has no room for a laptop, we felt the larger version made more sense. If I had to use one word to describe the Tenba Cooper 13 Slim, it would be handsome. The Tenba website states “it strikes a balance between good looks and serious features” and I would say this is a very accurate description. Its classic, understated appearance makes it perfectly appropriate for the city, but it would feel as much at home on a walk in the wilderness thanks to its water-resistant canvas, fashioned from soft and easy-to-clean peach wax cotton. 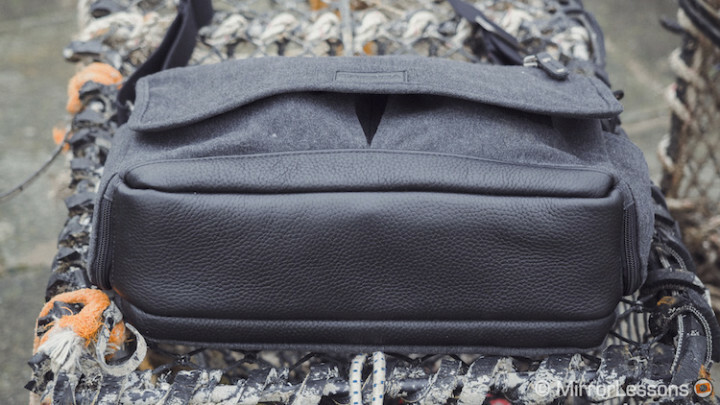 The only part of the bag that claims complete weather resistance is the leather base panel. Since the weather here in Wales has been consistently miserable for the past few weeks, there has been more than one occasion that I’ve had to put the bag down on a wet surface or carry it around in the rain, and it’s always come out unscathed. In fact, I would say the bag looks as good as it did when it first arrived on our doorstep. To give your gear extra protection on wet days, you can also choose to close the bag’s main opening with a zipper. 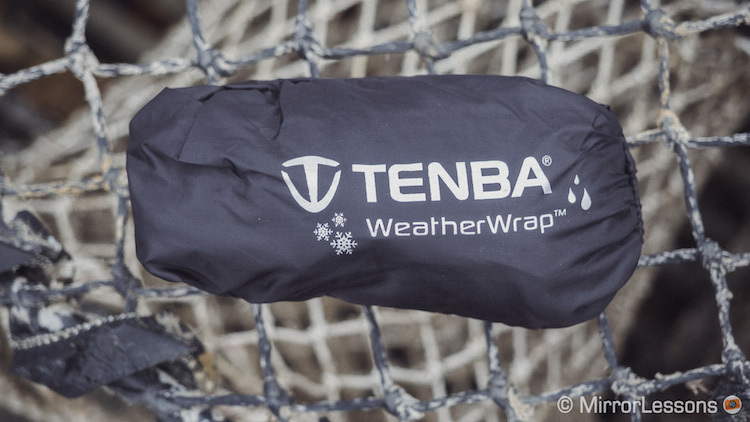 As with every Tenba bag, you also receive a rain cover that protects it from torrential downpours. I only had to use it once during the entire testing period and it is a perfect fit. 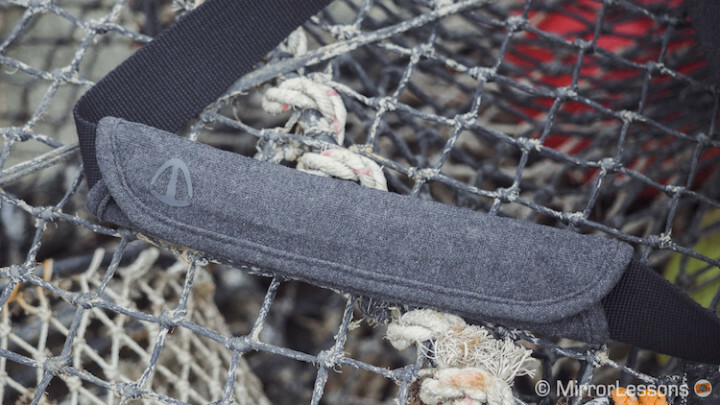 Interestingly, you have a choice between a light side to reflect the sun and keep your gear cool, and a dark side to maintain a discreet profile. These first two pockets are ideal for carrying around large and relatively flat items. I’m particularly glad that Tenba decided to include one on the front flap as it is quick and easy to reach if I want to temporarily store something like a receipt or train ticket. I tend to keep valuables such as my wallet and keys in the second flat pocket because of the two layers of production: the secure zipped closure and the flap that covers it. The third pocket is the perfect size for my 13” Macbook Air but anything thicker might be a bit of a squeeze, especially if the bag is packed to the brim with camera gear. This particular pocket blends in so well with the rest of the bag that sometimes you forget it’s even there! It is inside these pockets that I store all my accessories, from cleaning cloths to memory cards to air pumps. They provide plenty of room but since they don’t have a closure of any sort, they aren’t ideal for valuables. Of all the pockets, I find these two the most ingenious. 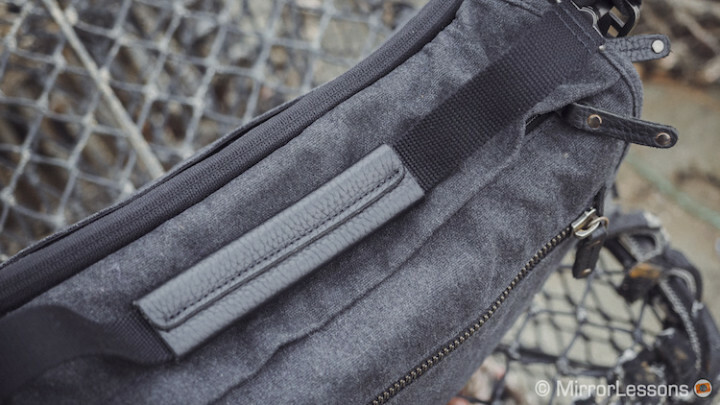 Both feature a zipper down one side which, when closed, flattens the pockets against the bag. In this state, they are a good size for smartphones or the provided rain cover. When unzipped, however, you can easily fit an average-sized water bottle or even a standard zoom lens such as the M.Zuiko 12-40mm f/2.8 inside. Another useful addition is the pair of quiet velcro closures on the front of the bag. Originally developed for military use, this new kind of velcro hardly makes a sound when disengaged. All you have to do is pull down on the front flap before pulling it away from the bag. It isn’t 100% silent but it sure beats the ripping sound ordinary velcro makes. Do keep in mind that if you rip the velcro away from the bag without pulling down first, it is just as noisy as ordinary velcro. 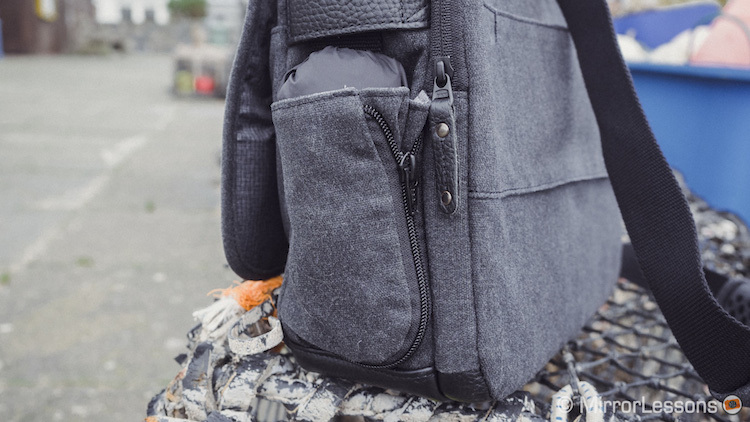 As has become the standard on Tenba bags, the Cooper Slim 13 has a quick-access top zipper that makes it possible to retrieve your gear without opening the main flap. The implementation is very good thanks to the smooth zipper. 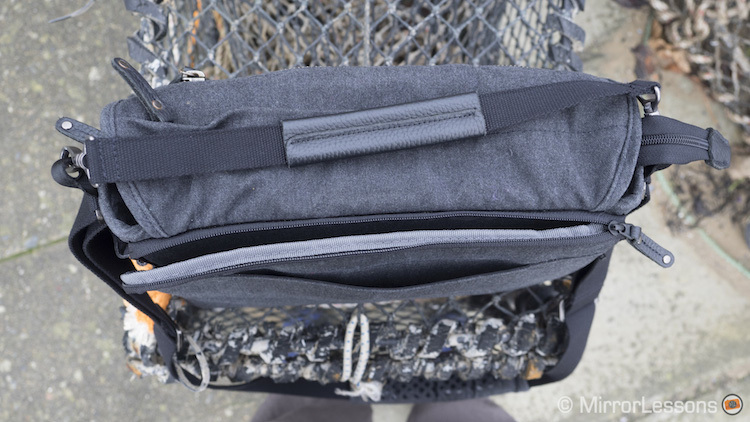 Personally speaking, I prefer to lift up the main flap so that I can clearly see all my gear but were I in the city or an area where I didn’t want prying eyes peering inside my bag, I would happily use the quick-access opening as an alternative. Something else that should be noted about the Cooper Slim 13 is that it doubles up as a general-purpose bag. This is because you can remove the padded insert to make room for notebooks, laptop chargers, and so on. 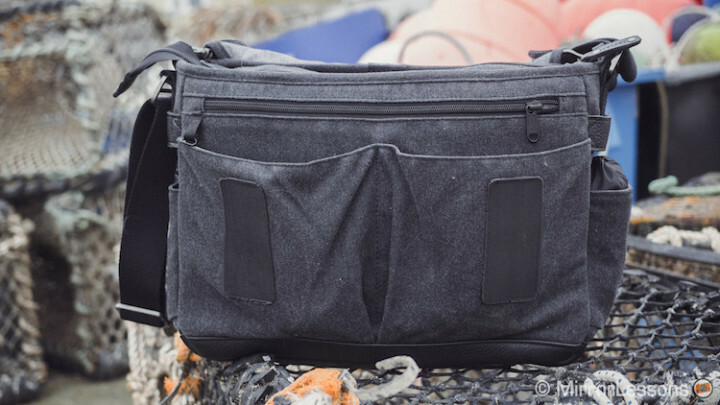 Whether you’d use the same bag for business and shooting is up to you but it is nice to know the option is there. 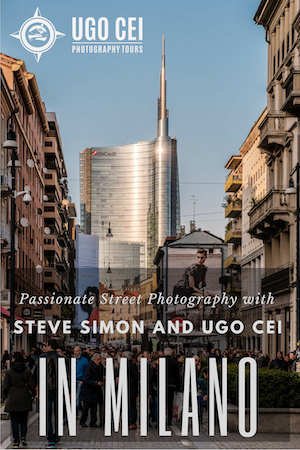 Finally, we have a couple of other features that can make life easier for the travelling photographer. On the back, there is a handy pass-through that you can use to slide the bag onto the handle of your trolley, and to carry around the bag, there is an adjustable shoulder strap with a comfortable non-slip shoulder pad. Unlike many other shoulder pads, this one is removable, so you have the option to replace it if you already have a shoulder pad that you like. Now that I’ve covered all the positives, there are a few negative points I’d like to touch upon. First, the bag has the tendency to topple forward when it is top-heavy, even when it’s placed on flat surfaces. Since the padded insert has two levels, I often end up using just the top level when I only have one camera and a couple of lenses and this can create some unbalance. The problem is exacerbated when I place the strap in front of the bag, as it pulls the bag forward. Thankfully, this doesn’t happen all the time. 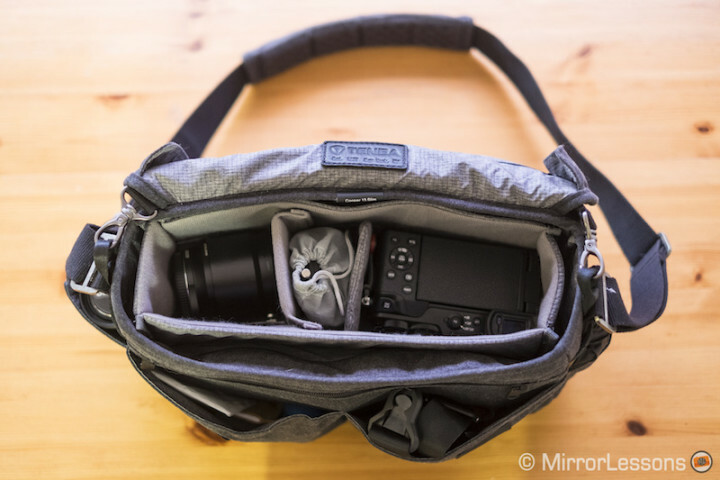 It all depends on how you position your gear within the bag and how much gear you’re carrying. (Generally speaking, the more gear you carry, the more likely it will stand up straight.) That said, I admit this was a slight disappoint because I have used bags such as the Think Tank Lily Deanne that never fall over regardless of how they’re packed. Another feature I feel doesn’t really benefit the user is the handle. It is too long and bulky, and its length cannot be adjusted. I often find it gets in the way of the quick-access zipper which defeats the purpose of having the zipper in the first place. However, it can be removed. 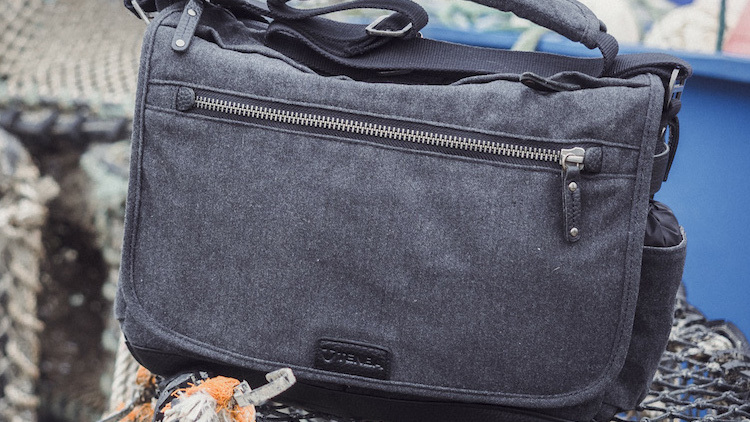 The Tenba Cooper 13 Slim is a deceptively spacious bag with numerous spaces and pockets for all kinds of gear and accessories. 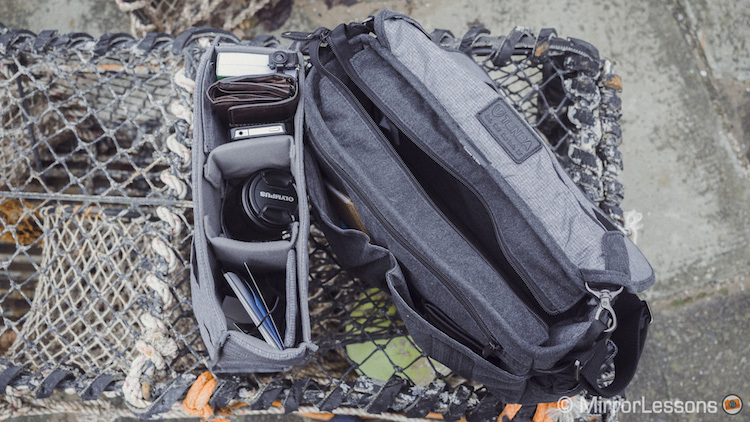 As I mentioned before, the bag has a removable padded insert that can house a mirrorless body and 3-5 lenses depending on the system you use. 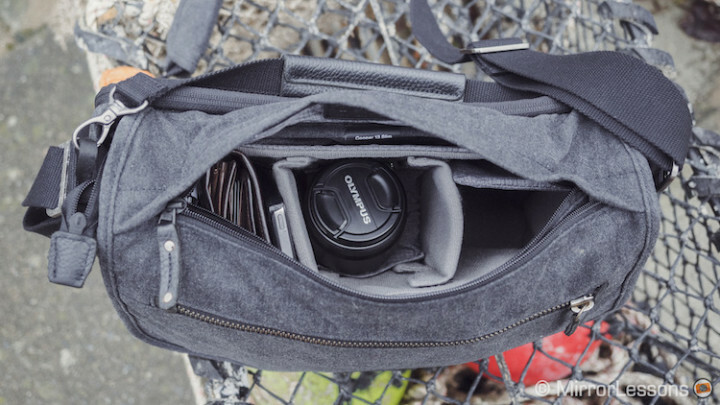 It provides good protection and be rearranged to suit the amount of gear you’re carrying and the size of each lens/camera body. 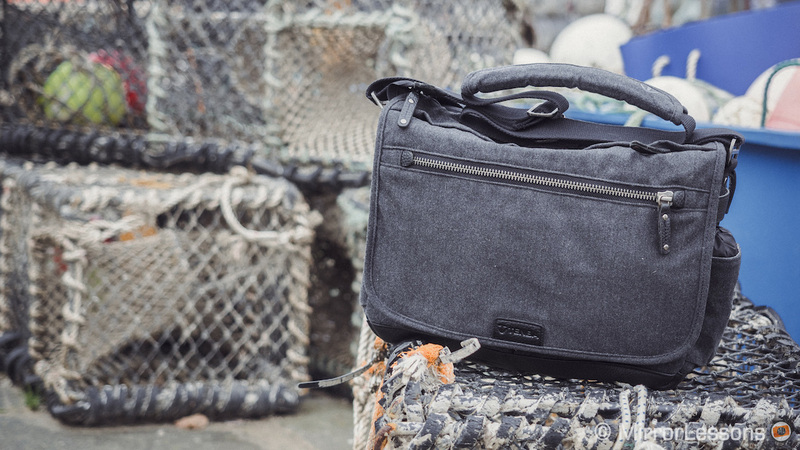 It also features two flat external compartments that are ideal for small accessories that won’t fit anywhere else. I’ve generally found it easier to remove the insert during the packing process because you can see and arrange the dividers more efficiently. Since Mathieu and I own more Micro Four Thirds gear than anything else, this is what we used to fill the Tenba Cooper 13 Slim. Below you can find a full list of the gear we managed to fit without overloading the bag. 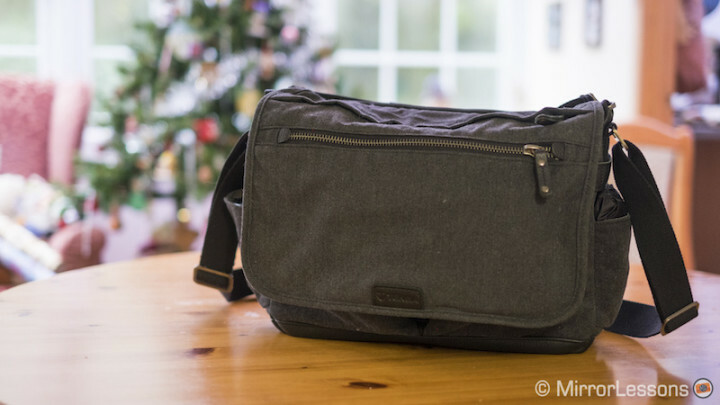 The Tenba Cooper 13 Slim is yet another example of how far camera bags have come in just a few years. Combining a handsome appearance with many modern characteristics such as robust water-resistant materials, quiet velcro closures and a quick-access zipper, it is the kind of bag you’d feel comfortable using in any environment, from formal business trips to casual walks through the woods. 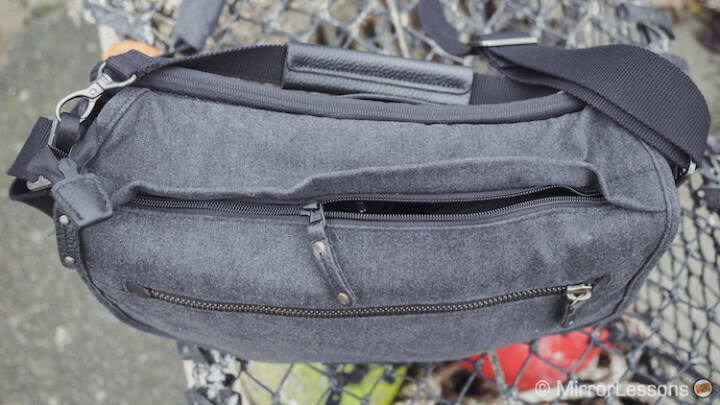 What’s more, you can even transform it into an all-purpose bag simply by removing the padded insert. Perhaps the only real objection I have, besides the fact that the bag doesn’t always stand upright, is that it lacks that “wow” factor I’ve come to expect from the products I review. 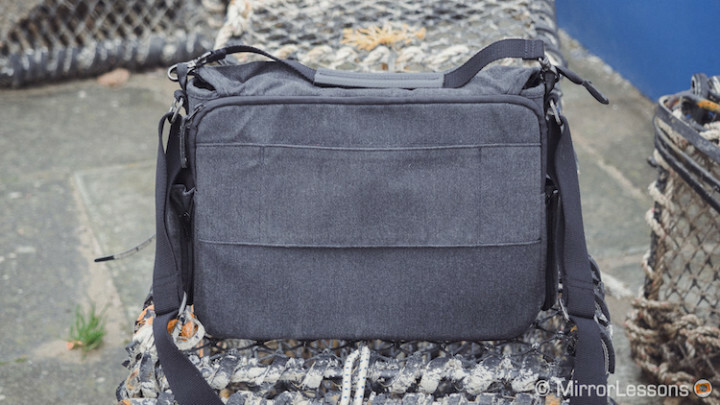 Don’t get me wrong: I like this bag and wouldn’t have any trouble using it for work or casual shooting, but having used so many other similar messengers from various brands, I find myself struggling to pinpoint a standout feature that would make me recommend it over others on the market. 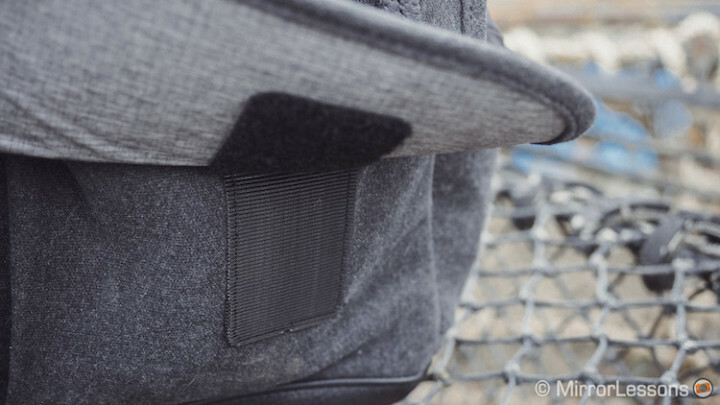 Even the silent velcro, something I haven’t come across on another bag thus far, is easily matched by the magnetic closures of the Think Tank Lily Deanne or the MagLatch™ closure mechanism of the Peak Design Everyday Messenger. 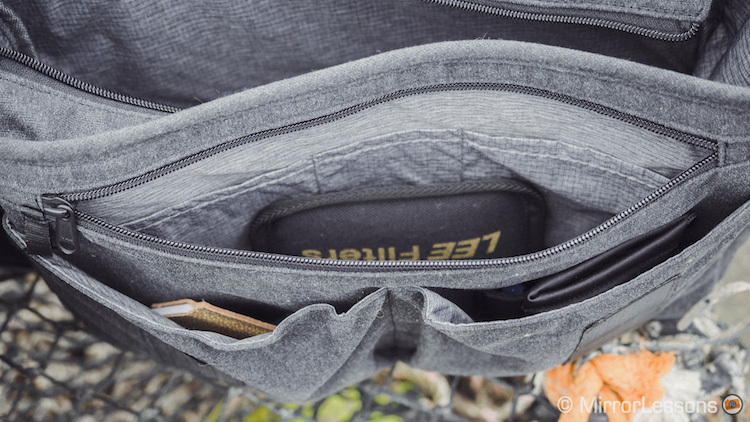 What I can say, though, is that the Tenba Cooper 13 Slim is absolutely on par with the best camera bags I’ve tried in terms of both usability and good looks, which despite its lack of originality, is probably a compliment enough in itself.